E Will The Market Stall? The VIX trades opposite the SPY. It is common for the VIX to lead (in the opposite direction) the SPY. Today the VIX matched its previous low and SPY closed above its previous high and a short term divergence. It's also a bearish sign when the SPY closes positive for the day and the Ticks closed negative. Some times it marks a short term high and other times it takes energy out of the rally. Today the SPY closed higher by .66% and the tick closed -37. Short term the market could stall here but the intermediate term trend appears up. Sold long SPX on 3/13/19 at 2810.92= gain 2.47%. 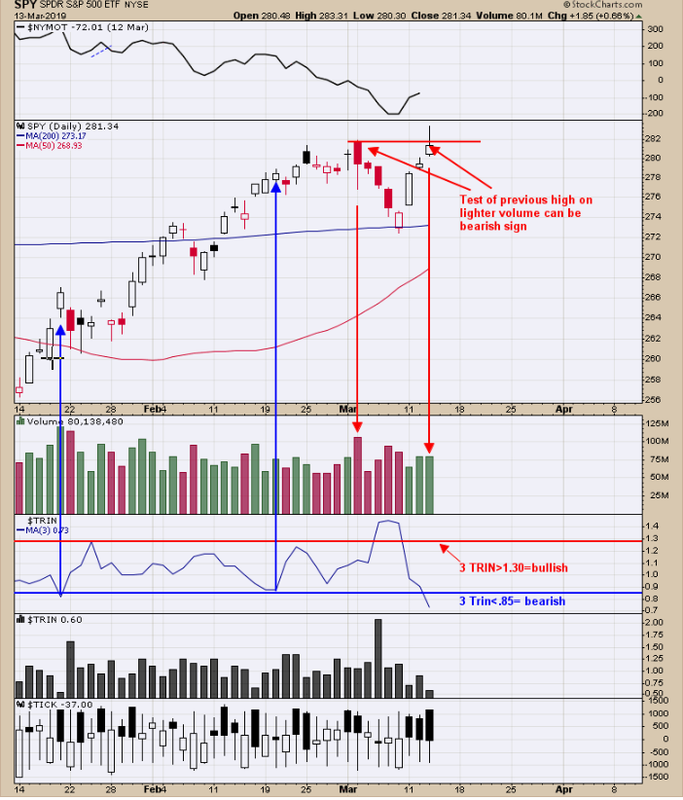 Today the SPY tested its previous high on about 20% lighter volume and closed below the previous high suggesting the previous high as resistance. The “3-day TRIN” closed at .73 (third window up from the bottom): closing below .85 has been a short term bearish sign. This week is option expiration week which normally has a bullish bias ( March expiration is up 68.57% ) therefore market could stall here and hold its gain into Friday. Don’t see a clear edge here so we sold our SPX long position for a 2.47% gain. Intermediate-term still looks higher. 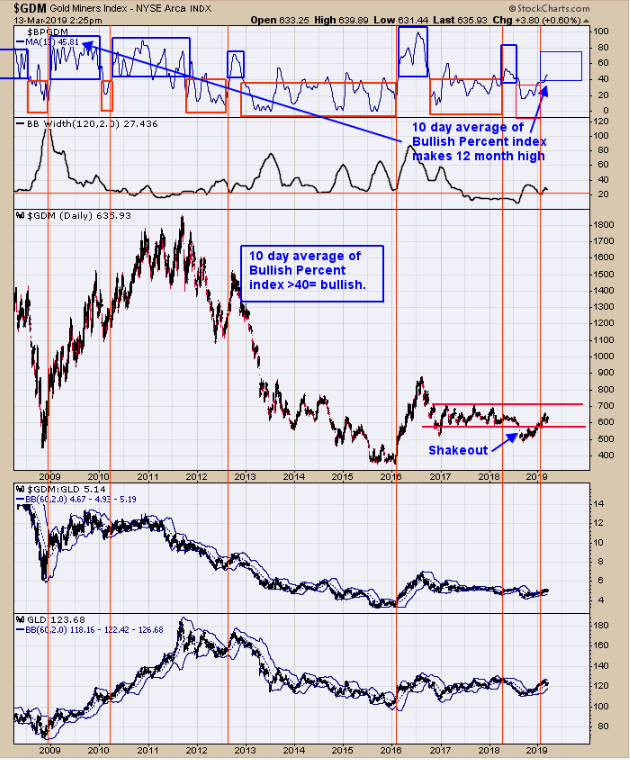 The top window is the Bullish Percent index for the Gold miners index. The Bullish Percent index measures the percentage of stocks that are on Point and Figure buy signals. We have boxed out in blue when the Bullish Percent index for the Gold Miners index where above 40%. When above 40% the Gold Miners index was generally in a bullish trend. Current reading sets at 45.81%. 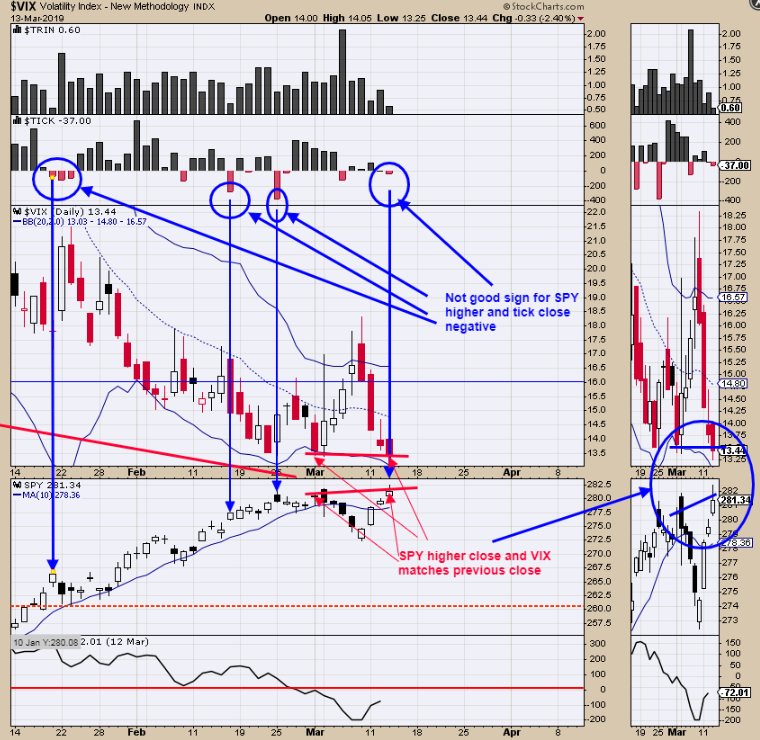 The middle window is the Gold Miners Index (GDM) and looks similar to GDX in price. A “Shakeout” was recorded in late 2018 and has since moved back inside the trading range bound by price between 600 and 700. GDM at a minimum should test its trading range high near 700 (corresponds to 25.00 on GDX). The 700 GDM is our short term target and will have to see what develops there. Long GDX on 1/29/19 at 21.97.